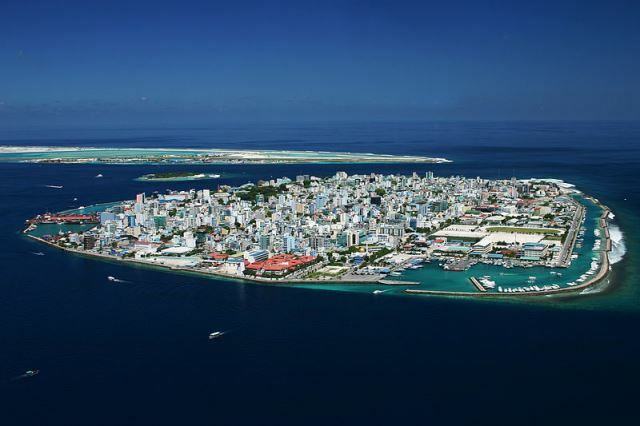 Male’ (pronounced as Maale’) is the capital and biggest island in the central region of the Maldives. It is home to approximately 150,000 residents in 6 square kilometers of land, making it among the most densely populated capitals of the world. The island of Male’ lies less than a meter above sea level and is the world’s smallest capital. Male’ International Airport (now known as Ibrahim Nasir International Airport) is just 10 minutes from Male’ by ferry which is operated 24 hours. There is a ferry going each way in every 10 minutes, except after 00.00hrs. The airport and Male’ are two separate islands and there is no road access. Government is planning to build a bridge between two islands in years to come. The country being dispersed over a large area of sea, every island has transfer to and from Male’ to obtain resources which are not available in small communities of other islands. Male’ is the central resource hub serving entire nation. That makes Male’ overcrowded with busy people moving up and down the streets. Having located close to the airport it may be a good experience to visit Male’ for sightseeing and shopping. When you are travelling by ferry you could see a large flag waving in the skyline of Male’. Once you are in Male’ you just have to walk to your right, towards the flag. On the way you will see President’s Office and near the flag are tourist shops selling souvenirs. When you walk straight the same harbor-side road you will reach Fish Market and Local Market, it just takes couple of minutes. Once you are back to the flag, there is building with large golden dome, it is the Islamic Centre. Muslims go there to pray. There is a notice for non-muslims to cover their body from shoulder to ankle when entering Islamic Centre. Most tourists take pictures at the stairs and move on for other attractions. To the east of Islamic Centre, behind President’s Office, is an ancient mosque known as Old Friday Mosque. It is entirely made of coral stones and wood, with no cement or clay. It is one of the oldest buildings in Male’ and is still used to this day. Opposite to the Old Friday Mosque is President’s Palace. It served as President’s Palace for generations until it moved to Theemuge in the last decade. In 2008 the palace was once again declared as President’s Palace. The National Museum is also not far from Islamic Centre, its just a couple of minute walk down by the traffic lights. It is open week days from morning till 17.30hrs. On the internet you can often find the Maldives capital written as Male which is wrong. The right way is actually Male' with the apostrophe. Websites that don't support special characters often write it wrong. If you are mailing a package to your friends in Maldives make sure you write it correct.